The price when purchased today is on Special. 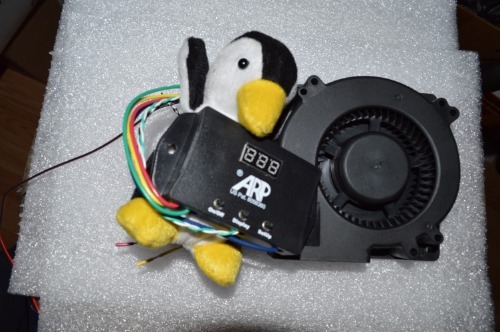 We will credit you back $25.00 For this purchase if you send us a link of a YouTube Video of your ARP 3.1 & Fan install. Details are: send the Video we can show a link to from our web site, helping other customers see how easy it is to install. You must show the unit Purchased from "RV Cooling Unit Warehouse" in order to receive the $25 credit refund issued back. The listing is for the ARP3.1 with Fan Controls and a new Fan installed on the back to increase the air flow through the condenser fins for max cooling and coil protection. 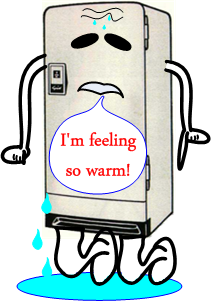 Your RV Refrigerator boiler operates at about 350 degrees all the time, but even a brief time off-level, like driving up a hill, can send that temperature sky-rocketing. Events like this produced a lot of thermal stress in the fridge boiler, stress that causes the metal to fatigue and the anti-corrosion chemicals in the coolant to deteriorate leading to fridge failure and perhaps even causing an RV fire. This is the reason for Dometic and Norcold recalls leading to class action suits. The ARP Control can monitor the boiler temperature and automatically shut down the boiler if temperatures begin to climb out of normal range. 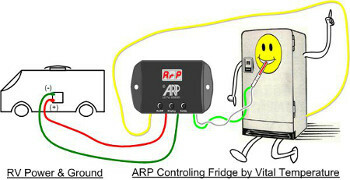 Best of all, ARP continues to monitor and re-starts the fridge once it cools down again, so that your food doesn't spoil. And all without any effort by you! ARPrv wants to help with all your needs for Dometic and Norcold refrigerators. If you cannot find what you are looking for please use the Contact Us form found in the top and bottom menus. We have all heard about the series of recalls for Dometic and Norcold RV refrigerators. These recalls attempt to address premature refrigerator failure and fire danger. As a frustrated consumer, the inventor of the patented ARPrv Control found what made these once reliable fridges vulnerable to damage, both long term and immediate resulting in catastrophic failure leading to loss of property or worse yet human or pet life. The source of many of these issues is a lack of active temperature management of the cooling unit which allows it to overheat on a regular basis, causing slow but cumulative damage that can result in a dangerous situation which may have otherwise been avoided. ARP addresses both these problems with a more sophisticated management technique that controls the cooling unit better, plus it has the major advantage that it will automatically re-start the fridge cooling unit after a high temperature cut-off. This avoids the loss of the food kept in the fridge. The ARP Control has been designed to be simple on the outside making it easy for Dometic install and Norcold install. The drawing to the right shows how easy it is to install, just provide power, run one wire to your fridge control, and install the temperature sensor. WHY IS THE ARPrv CONTROL BETTER? The Dometic and Norcold recalls and controls do a great job for what they are designed to do. These factory controls keep the inside of your fridge cold, but do not keep the refrigerator heating system from overheating the cooling unit. Because the ARPrv control is designed by a controls system engineer, the inside of the ARP has a smart control scheme. Smart means that you enjoy your adventure and ARP keeps your fridge running safe. This smart method senses overheating situations and automatically turns off the heaters, then restarts the fridge when it is safe, usually before the inside of your fridge can warm at all. This safety device can be installed on any model, any brand, and any size. 1) Please use the link below to view the User Guide for installs of the ARP on specific models of refrigerators. 2) We have the ARP 3.1 control with the absorber fan control, to control either an outside condeners fan or the inside evaporator or both. 3) The fan control will work with any number of fans and will work with any brand. This control will give the operator control over when and how long the defrost cycle is. Sorry our little Mascot stays here, he must work to pay for his keep.